It turns out one of my biggest problems promoting myself just might be that I’m uncomfortable spamming my social networks. Okay, maybe spamming is too harsh a word, but…it’s become more evident than ever that I do not like turning my blog and social networks into “Do this, please!/Buy this, please!” calls to action. 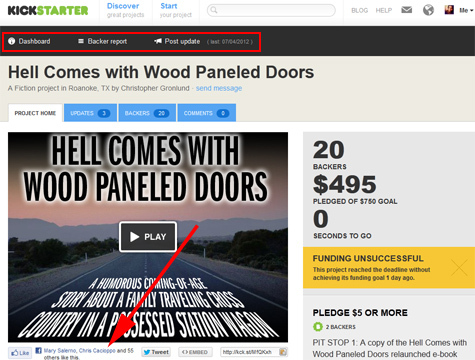 The Kickstarter project for Hell Comes with Wood Paneled Doors ended July 5, and I didn’t meet the goal. I originally thought about shooting for $500 — and would have hit that — but I was $255 shy of my $750 goal. Still, it was a very cool 30 days. I like sharing things I learn along the way, so what follows are all my numbers and thoughts about Kickstarter…everything except the names of the people who contributed. Sorry the images are small — if it’s that annoying, I could make a stand alone page without any sidebars, with larger images — like my Evernote for Writers page. But I really think this should be good enough. I wish I could still update everything and show a walk through of setting up my Kickstarter project, but since it’s done, I no longer have access to the set-up screens. Still…it’s pretty easy stuff! Kickstarter makes everything easy, and if you get lost, there are good FAQs explaining things. Once you’ve set up your Kickstarter project, when you view it while logged in, you see what others see…with an exception: you get a little menu bar along the top. 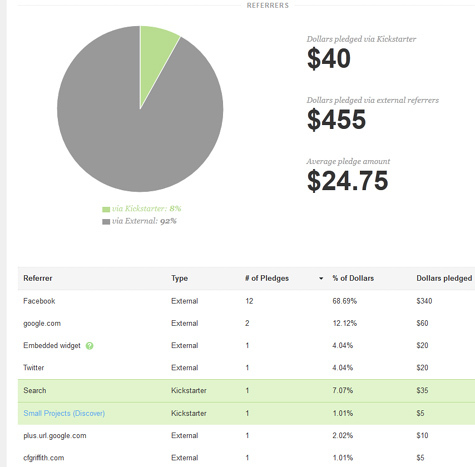 From there, you can access the Dashboard, Backer Reports, and create Updates. A total aside, here: one of the things I found interesting is how many people saw the project and clicked LIKE on Facebook, but how only a fraction of those people actually contributed. (55 Facebook likes; 20 backers…not all from Facebook.) Granted, I don’t expect people to contribute at all; there are people close to me who didn’t contribute, and I’m totally fine with that — I expect nothing as a writer. Still, I found the LIKE thing interesting because it’s something we all face as we try promoting the things we’re doing. Even after factoring in households where one contribution was made and two people in the household clicked LIKE, we all face the easiness of the LIKE button on Facebook. 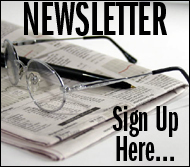 People feel busy, and it’s much easier to click a button to say, “Cool,” but not take action. Obviously, this is why marketers say you have to keep at it, getting the same people to see things 3-10 times before they take action. Personally, I feel like I’m crossing a line into annoying territory when I mention a project all the time. Others don’t, and I’m sure they sell more than I do. Just an interesting little thing I thought I’d share. Most of us know that it’s easy to get someone to click LIKE or retweet something; much more difficult to get them to take action if that’s your hope. Finding that comfort zone of how much promoting you want to do is the big challenge. I’m sure I could have been a lot more loud, hit my goal, but at the risk of some people hiding or removing me on some social networks. An occasional mention is something I’m fine with, but I’m not cool spamming people I know. 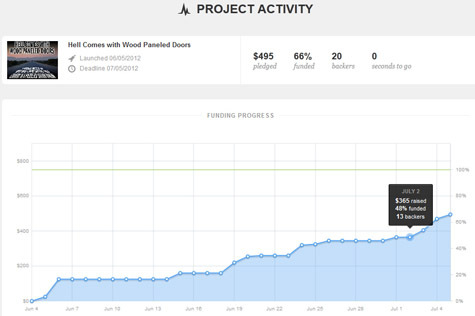 The Project Activity statistics are the first thing seen when clicking the Dashboard view when logged into Kickstarter. It’s a quick overview of how things are going: when the project started, when it ends, how much has been pledged, and some other things. There’s also a graph showing the climb toward your goal amount. The Project Overview is a snazzy glance of how you’re doing. The message is pretty clear: in my case, had I kept hammering my social networks, I may have hit my goal. Most backers came through social media sites. In my case, I’m not comfortable posting even every-other-day messages saying, “Hey, contribute/buy my stuff,” even though there are those who do it all day long. I like sharing and chatting with people — not selling to them. I’m patient, and fine with a slow climb, even if it means not hitting a goal. Kickstarter’s video stats are cool. Again, you get to see how many people viewed the video on Kickstarter, and how many viewed the video embedded elsewhere. You can also get an idea of how effective your video is by looking at how many people watched it all the way through. I shot the video on the side of the road in my car. 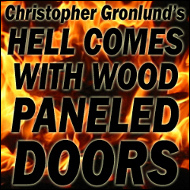 (Hell Comes with Wood Paneled Doors is a road trip story, after all.) I’m wearing sunglasses, so you can’t see my eyes that well. When asking for money, probably best to let people see your eyes — it builds trust. Anyway, there are the video stats. Next, you get a view of what rewards are most popular with backers. 7 Backers — 35% of backers — went for the $20 reward. $140 was pledged, accounting for 28% of all money raised. I figured the $5 – $10 reward would have been the most popular. Lesson learned: don’t sell yourself short! You also get the chance to relive the fun through the Activity view. From the beginning, to the very end, you can see the whole thing unfold before your very eyes! It’s nice having this overview of everything while the project is going on, and nice to be able to look back when it’s all done. 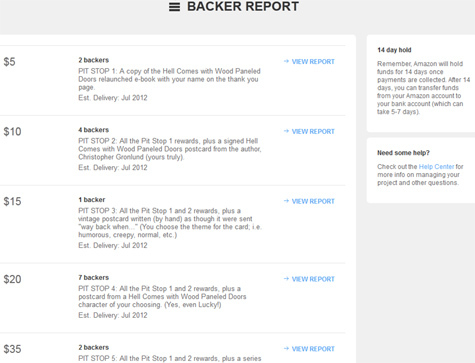 On the main view, next to the Dashboard link, is the Backer Report. The Backer Report is a great overview of how many people backed the project, and what reward they want. For additional details, clicking the View Report link to the right of each reward provides additional details. 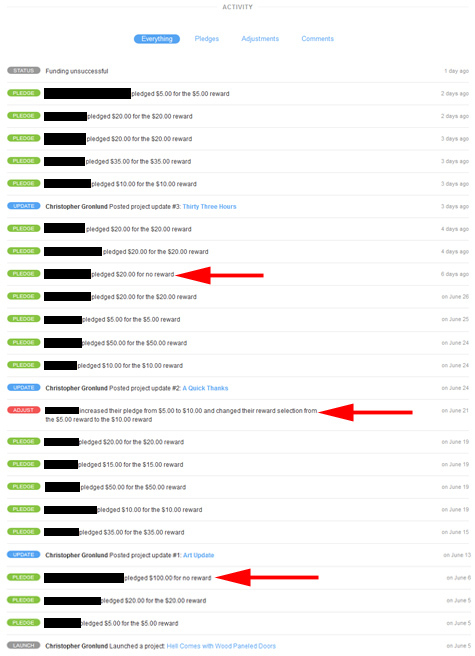 If I click on the $20 reward report, I get to see the names of the people who pledged and what day they pledged. I also have the option of making notes for each backer. 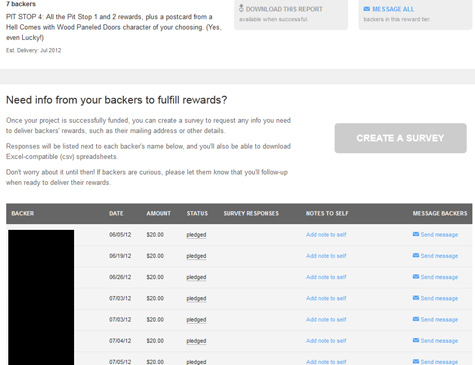 I can also message each backer. 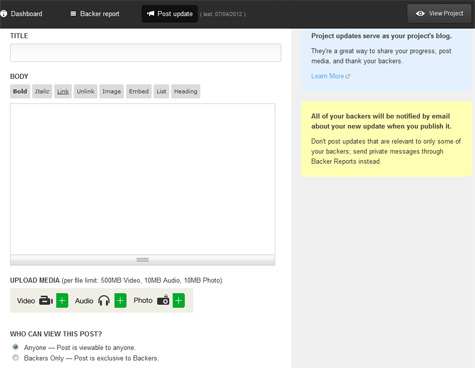 From the main view, you can also post updates. As a fairly frequent backer of projects on Kickstarter, I love updates. I like behind-the-scenes videos, status updates, sneak peeks at chapters and art. Creating updates is like creating a blog entry: just fill in the blanks, attach any video, image, or sound, and voila! you’ve just created an update! I should have done more updates. 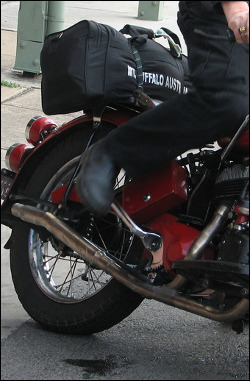 With a road trip novel, I should have hit some quirky Texas roadside attractions and created updates there. At the same time, I knew it was likely the project wouldn’t be funded. That, and I was busy looking for a new day job and preparing for a presentation I did at Emerging Tech Conference Dallas. But I did step outside after my talk to shoot a video for backers. I kept all my updates for backers only. You can also make them public, but I wanted to at least feel like backers were getting something nobody else could get. Were I to do this again, I’d create a schedule of much cooler updates. 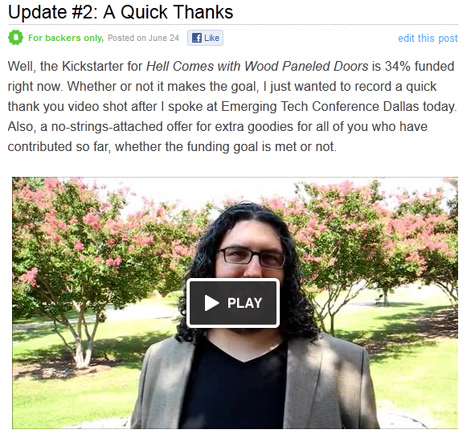 So that’s it: a peek behind things with my Kickstarter project for Hell Comes with Wood Paneled Doors! There’s a lot I’d do differently were I to do it again, but it was a great experience. I wish I could show some screenshots about fulfilling rewards, but since it didn’t reach the funding goal, I don’t get that option. If I ever do it again, I’ll share the entire process, with bigger images — from start to, hopefully, fulfilling a funded project. In the meantime, I hope this helps anybody considering a Kickstarter project of their own. And I’m curious for those who back Kickstarter projects: what do you like when it comes to rewards, updates, and other aspects of a project?